Comments: Shipping was fast and satisfactory. Cons: does not look like the photo. Will be very hard to clean. Cons: The color was not exactly what we were expecting. Comments: Shipping came faster than usual. Was quite pleased with that. Pros: I love this! It's not too small and not too big. Hits great. Very easy to hold onto. Pros: easy to hit, clears really well, good size for chilling in bed with a bowl. Comments: overall, its a nice piece! Cons: Smaller than expected and skinny but other than that there isn't any cons to it. Pros: It's a good piece. It hits like a beast but easy to clear. Multiple ways to hold it, and convenient sized. Pretty cool looking too. I got the green one, it was a bit different than the picture. Only the bottom didn't have a red tint, and neither did the bowl. Cons: The bowl and down stem are pretty fragile. I broke the bowl just by hitting out the ash on my hand. And a scraper feel on the down stem. It's worth the price though. Pros: It's beautiful and very well made. The glass is thick and it's easy to transport. I love this piece. Cons: Only con I have it my downstem snapped but it doesn't change my mind about this piece. Pros: Colors are awesome. Hits well. I was nervous whether it would appear like the picture or if it would live up to the other reviews but it definitely did. Pros: Small, compact, and killer. Without a doubt its a small piece but a killer. It's a friendly bong for inexperienced smokers. I keep mine in the freezer all the time 5 minutes prior to use i put water in it and put it in the freezer once again. Hits real nice and smooth and easy to maneuver. Cons: It smells when cleaning it but, c'mon what water piece doesn't smell after using it. Pros: Really glad i got this. Hits with a nice kick, really effective and easy to clean. Awesome design. Comments: I ordered a slightly bigger 9mm slide with it, but the one it comes with is good too! Pros: Great water pipe! no complaints here, does its job! Cons: broke a seal within the first twenty minutes of having it. Pros: Pretty piece hits very well Great price great buy! Cons: I owned mine for almost six months when it just shattered - I suppose the stress of the heat caused it, I dunno. Since it's prone to topple I kept mine always inside a corrugated cardboard box. Cons: it didnt come in the colors like the pic showed but its all good. and a little bit of water gets in to the hooks on the zong. but its all ok i love it. Pros: I love this bong, it hits like a champ and the size is perfect. Cons: None, the bowl mine came with fit perfectly. Pros: GREAT WATER PIPE! Hits smooth and FAT! Absolutely love it. Cons: The hole for the bowl/downstem is REALLY big. you'll need a pipe screen forsure unless u want to pack big bowls. any kind of screen will work. for example i didnt have any screens so i took a screen from my faucet and it works fine. doesnt make your smoking blend taste bad either. 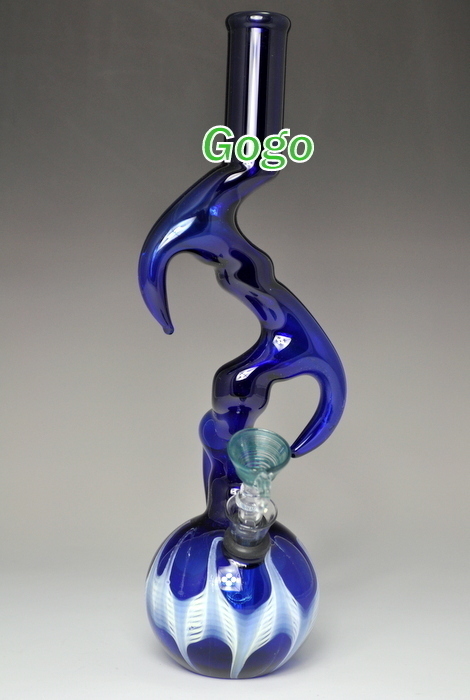 Comments: everythins all good and i give gogopipes mad props for making and sellin such high quality glass at such ridiculously low prices. also got a question tho: could u fit a 14mm glass bowl in this downstem/bowl? cause i dont really want to have to buy a whole new downstem along with a bowl.